If polls are any indicator, Patrick Buchanan is headed for defeat this November, and he's taking the Reform Party with him. Buchanan's numbers have fallen from highs of 8 to 10 percent to a current low of 2 to 3 percent, and he's being outpaced in some states by Green Party candidate Ralph Nader, who only recently entered the campaign. University of Virginia political scientist Larry Sabato says there are two reasons for Buchanan's decline: The splintering of the Reform Party into competing factions supporting Buchanan, party founder Ross Perot, Jesse Ventura and even Ralph Nader, and the conservative commentator's own behavior. Satabo sees Buchanan as playing the same kind of divisive role in the Reform Party that he did as a candidate for the GOP presidential nomination. "Patrick Buchanan has done again what he does best - wreak havoc," Sabato said. Sabato added: "These are happy times. There isn't much of a market for Patrick Buchanan's gloom and doom." Since seeking the Reform nomination, Buchanan has increasingly called attention to conservative issues that the party intentionally left out of its platform, including his vehement opposition to abortion and homosexuality, and his support of flying the Confederate flag. Such talk has prompted some of his supporters, including Marxist Lenora Fulani, to withdraw their endorsements. In a letter to Buchanan announcing her resignation as his campaign co-chair, Fulani accused him of "backtracking" on his promise to create a broad coalition. "I must and do object to your efforts to transform the party into a party of, and for, only social conservatives" wrote Fulani. Buchanan has said publicly that his battles with state Reform parties - who elect delegates to the party's national convention - forced him to consolidate his base. Buchanan's press director referred CBSNews.com to his boss' recent comments on the on the MSNBC program Hardball with Chris Matthews. Buchanan acknowledged the current rift within the Reform Party. 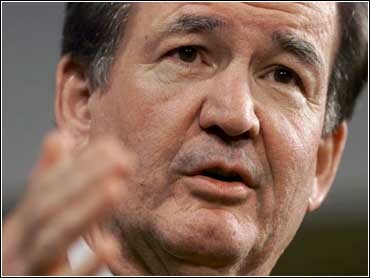 "Is everyone happy with a Pat Buchanan nomination? Of course theyre not," he said. The candidate has called his effect on the party "Buchananization." "It's hard to know exactly what the party is at this point," said Ronald Rapoport, a political scientist at the College of William and Mary. Rapoport, who is co-authoring a book about the Reform Party, says it is typical for third parties to be run from a "top down" approach, noting Perot did the same thing. "He has basically taken over the party," Rapoport said. Russell Verney, a Perot spokesman and the former chairman of the Reform Party, agrees. This is "essentially a hostile takeover of the Reform Party to make it socially conservative," said Verney. "They're trying to ake the party look like their campaign, which is analogous to throwing sharp elbows at your friends." Verney said the candidate never tried to hide his conservative agenda. "It's not like we were babes in the woods," he said. But even though the Reform Party platform doesn't address social issues, some political observers suggest party leaders were naïve not to consider that Buchanan would try to impose his views. "They were extremely foolish to think Buchanan would set aside those issues and not talk about them. They're (Verney and Perot) nobody's fool, but it is a mystery to me," said Sabato, who believes the party was desperate for a candidate and courted Buchanan because of his high name recognition. Buchanan does face a challenge for the Reform Party nomination from former Natural Law presidential candidate John Hagelin. Hagelin said he is mobilizing environmental groups, college students, women and minorities who he says are offended by Buchanan's message of intolerance and exclusivity. "We are doing an end-run around Buchanan's Bolshevik tactics at the state level," said Hagelin, a research physicist who has waged independent bids for president twice before. What Hagelin, Fulani, Verney and other Reform Party members fear is that Buchanan will drive away party members, whose numbers are already dwindling. The Reform Party candidate must win 5 percent of the vote in November to qualify in 2004 for federal funding, and at this stage of the campaign, that number appears to be drifting further out of reach. Perot won 19 percent of the vote in 1992 and just 8 percent in 1996. If the party does survive, no one expects it to remain the same. Though Buchanan has said he would not change the Reform platform, he will seek to attach a personal "statement" expressing his views. Verney calls that "a distinction without a difference." He suggests that Buchanan is already looking past the November election, using his position now to create a base of support for a new "ideologically pure, right-wing conservative party." Rapoport said that even without the obstacles facing the Reform Party, it would have a hard time surviving in the current climate of economic and social contentment. In explaining the fragile existence of third party campaigns, Rapoport refers to a favorite quote from Pulitzer-prize winning political historian Richard Hofstadter, who said, "Third parties are like bees. Once they sting, they die."